I’ve unexpectedly caught a cold, and not being in the mood to further aggravate my head – it’s been throbbing since seven in the morning – I’ve pulled together this rambling, disjointed review and haven’t bothered to check its coherency. Please excuse any grammatical errors. 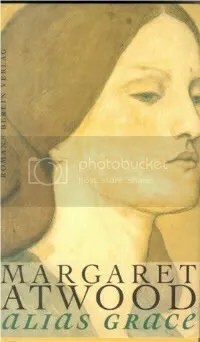 Margaret Atwood’s Alias Grace is a fictional account of the Kinnear and Montgomery murder case; the protagonist being convict Grace Marks, who has spent eight of her twenty-four years in prison. The characterisation is flawless; the writing divine. A large part of the story is recounted by Marks to her psychologist, and I thought it was an extremely effective and engaging means of narration. Atwood clearly is a first-rate storyteller. Her utilisation of the unreliable narrator to capture the troubled mind of the protagonist had me in raptures. The various letters and random bouts of stream-of-consciousness dispersed throughout the novel complemented the recount to create a spooky and shockingly good read. I say shocking because it feels immoral to have enjoyed (to the extent that I did) the story of two violent murders. At the Governor’s residence, Simon [the psychiatrist] is directed to the parlour, which is almost large enough to be called a drawing room. All possible surfaces of it are upholstered; the colours are those of the inside of the body – the maroon of kidneys, the reddish purple of hearts, the opaque blue of veins, the ivory of teeth and bones. He imagines the sensation it would produce if he were to announce this apercu out loud. I don’t know why, but I found that so amusing. Arguably, the book’s great strength lies in its elegant and evocative descriptions of the domestic activities that once commanded the full attention of women from the less privileged classes. With startling authenticity, she renders, for example, the delirious joy that a fresh red radish or a newly plucked chicken offers a woman who has survived on prison fare. Out of the gravel there are peonies growing. They come up through the loose grey pebbles, their buds testing the air like snails’ eyes, then swelling and opening, huge dark-red flowers all shining and glossy like satin. They burst and fall to the ground. In one instant before they come apart, they are like the peonies in the front garden at Mr Kinnear’s, that first day, only those were white. Nancy was cutting them. She wore a pale dress with pink rosebudus and a triple-flounced skirt, and a straw bonnet that hid her face. She carried a flat basket, to put the flowers in; she bent from the hips like a lady, holding her waist straight. When she heard us and turned to look, she put her hand up to her throat as if started. Sadly, the last few chapters lose steam. Atwood builds layer upon layer steadily, then suddenly, the solidity is completely shattered by the hypnoticism scene. There is a perfectly scientific explanation behind what happens in this scene, and it’s all well that she is incorporating the obsession with Spiritualism and the supernatural that existed in Victorian society, but this was nothing more a contrived effort to strengthen the Gothic tone of the novel. I praised Atwood’s ability to write beautiful prose, but behind the pretty words, there lurked a question: what really happened on the day Kinnear and Montgomery were murdered? And of course, another: is Grace Marks innocent or guilty of the murders? Atwood is no criminologist, and this novel is pure speculation, but by including talk of ghosts and wandering souls into her narrative, she singlehandedly destroys the wonderfully tense atmosphere that she builds up in the first half of the novel. It lessens the credibility, and shatters suspension of disbelief. It’s not that I am dismissing the existence of a spiritual realm beyond our own. I was just bothered by the particular way Atwood incorporated this extra thread into her narrative. Can’t say any more than that because it would give the plot away. The ending is abrupt; then again, I am rarely satisfied with endings. I always get the feeling that writers hastily tie loose strings together because they want to get the project over and done with. Nevertheless, I did love this book. Am willing to try The Handmaid’s Tale, despite my previous reluctance. Plots tend to sound worse than they really are – I never would have thought that I would enjoy reading the tale of a murderess, but there you have it. It’s been a long time since I read this. I remember that the ending left me unimpressed, but I can’t remember what it was that bothered me. It’s probably the only Atwood that left me unsatisfied–I loved Handmaid’s Tale, Cat’s Eye, and Blind Assassin. I’m really looking forward to reading Cat’s Eye, and I’m even beginning to be curious about Handmaid’s Tale. To refresh your memory, the Committee perform some ‘scientific’ Hypnotism thing on Grace Marks, and the “spirit of Mary Whitney” speaks through her. Apparently, it’s Marks’ split personality coming through, but I found it unimpressive and unconvincing. I felt duped, hahah. Margaret Atwood could write the phone book and it would be beautiful:-). Chain Reader – that is so true! Feel better soon! I’m intrigued by this book. oops, sorry about your cold. zawan – Alias Grace was my first Atwood, b/c I wanted to read her work but I was wary of Handmaid’s Tale. I still haven’t gotten around to doing your 7 things meme; will answer it tomorrow.. I find Atwood a bit hit and miss, of what I’ve read I’d recommend A Handmaid’s Tale, Cat’s Eye and Moral Disorder. If the dystopian plot of AHT puts you off, I’d try the other two first as they’re modern realism instead of sci-fi.